I recently worked on these wedding announcements and a website for the RSVP and I realized that there are many qualities of branding that really fit into making a wedding announcement. A great brand is adaptable to it's various implementations, it's recognizable, and it's visually appealing. In planning a wedding, there are many similar decisions to make the whole thing feel cohesive and in creating a wedding announcement or invitation, there's a lot to learn from branding. First, it's an experience. You receive an envelope in the mail addressed to you, maybe it doesn't have a name on the return address, but it looks somewhat fancy because it's not a plain envelope. Opening up the back, you wonder what could be inside and maybe you first see the pattern on the back of whatever the card or letter is inside. Then you might flip over the card or see a picture of one of your friends from College and then you get really excited. Second, it's a message. Like all good branding, there is something it's trying to communicate and hopefully it's a clear message. Sometimes it can be over-cluttered with too much messaging, and sometimes, it's just a simple message with a link to a website to get more information. It gives you the information you need to take action, though whether it's the written copy or visual representations, it tells a story. Third, it's a piece of art. It's not necessarily one of those abstract things you stare at in a museum, but it delights you with its visual presentation. And inevitably, makes its way to hang on the refrigerator along with the crayon drawings your 2-year-old made for you. Ironically, in this time of technological progression, we all want a hint of timelessness that pulls references and styles from the past. Sometimes, getting invitations printed out at Kinko's just won't cut it anymore. 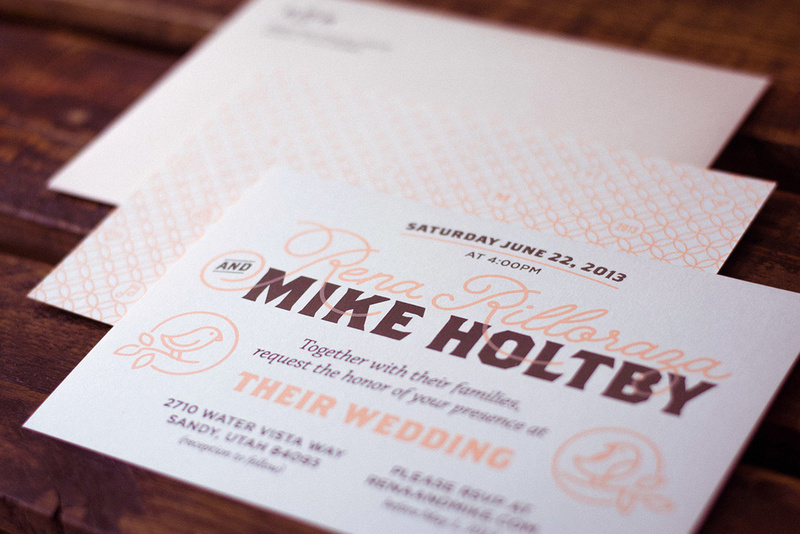 Letterpress or silkscreening has been getting more and more popular, and give your announcement enough quality for you to hold on to. Something you can put in your wedding album and remember. Lastly, it's disposable. Like all great branding, it's something that will be found in the garbage sooner or later, though hopefully if it's something well designed and a great experience, it may stay on that fridge for a long time.